The Powhatan’s supreme chief was Wahunsunacock and the Powhatan government was made up of a group which was called the Powhatan Confederacy which consisted of six constituent tribes. The tribes were the Powhatans proper, the Architeks, the Appamatucks, the Pamunkeys, the Marttaponis, and the Chiskiaks. Later on, the Kecoughtan were added to the Confederacy, which was important because it kept the tribes very close to one another and created a sense of trust between the groups. The Powhatans controlled over 30 tribes, and each one had their own sort of sub-chief (known as either a werowance or a werowansqua, depending on gender) who controlled things in their respective domains. The Powhatans ruled with their own set of laws, which were carried out by enforcers (if people didn’t follow the laws, the enforcers would beat them with clubs). Lastly, the Powhatans were especially nasty with trespassers and enemies, who they would torture with scalpels or other forms of slow and painful death. During the time of the Powhatans, Virginia (where they lived) consisted of vast forests and floodplains, which in turn brought a thriving marine life to the area. Because of this, the Powhatans set up their villages closer to the water, where they would be able to fish. The water was also their main form of transportation. The forest provided animals to hunt, trees to build houses, and plants/roots for medicine, as well as other natural fruits and vegetables for food. They also used the trees to build tools, which is an important part of advancing any civilization. Lastly, apart from fishing, the Powhatans used the rich style to farm their crops. This combination of fishing, farming, and hunting gave them stability as far as their food went, and allowed them to focus on other aspects of their society such as technology and other advancements. Crops and other farming resources were important in the Powhatan economy because farming the surrounding land had provided them with a large portion of their food (a lot came from fishing and hunting as well). Also, tools were very important because that is how the Powhatans would get their goods and materials. Other very important resources of trade were pearls and copper; these resources had been traded and spread throughout the Powhatan Confederacy. However, one of the most successful products created by the Powhatans was the arrowhead. They used stones to create the arrowheads, which they used both for hunting and for trading with other tribes and people. Lastly, many Powhatan women made pots out of clay and clothing out of fur/hide, which they either kept and used or traded as well. The Iroquois adapted their food source by beginning to fish since they lived near a river and this was another vital food source to their society. 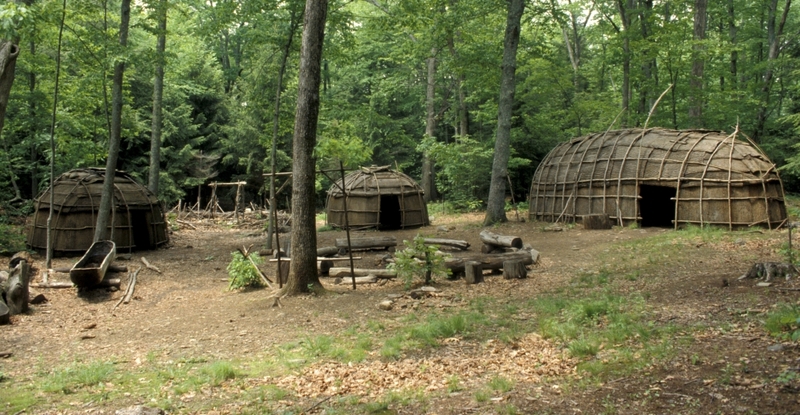 The houses of the Iroquois were made of saplings and elm bark which was an adaptation for housing. The soil that they lived on was also very fertile so this lead them to use the land for farming and this was another adaptation for a food source. The Powhatan people had a strong connection to their spiritual beliefs. They believed that the spirits would guide them daily as well as influence traditions and rituals. The Powhatans let dance connect them spiritually and have many dances that serve as Powhatan tradition. The main spirit the Powhatans prayed to was Okee, which they believed to be the only spirit thought to have a human like image. The Powhatans also believed that there was a sort of “Creator”, and also prayed to the sun, which they believed represented health, life, and home. The Powhatans were known for their various sacrifices, which they did to preserve the “spirits”. In addition, they had various rituals with similar purposes to common day practice (i.e. They had a ritual for the coming of age of a boy). Finally, the Powhatans had houses called kwiocosuks which were basically temples. Only chiefs or shamans could go into these buildings, which were set in the middle of the forest and were home to various spiritual advisors and doctors. The Powhatans lived in a top-to-bottom system of social structure. The hierarchy was headed by a chief (who inherited his/her power), who were followed by rulers, warriors, priests, and commoners. Warriors were given their power by the chief. Priests typically had much more power over rulers and those below them. One interesting fact is that when a Powhatan was granted a higher position, they would be introduced through a large feast. Another interesting fact is that the Powhatan society was matrilineal, meaning power was passed down through the female line rather than through the males. Lastly, there was a clear distinction between social classes, especially by wealth (i.e. Richer and more powerful Powhatans would have larger houses, more jewelry, etc). The Powhatans typically lived on high grounds near rivers, which they used both for food and transportation (they also used the rivers to bathe). The Powhatans towns were often palisaded which usually meant they were closer to enemy territory. They lived in houses called yehakins, which were barrel shaped huts made of wood. Each Powhatan town usually had around a hundred yehakins with between 6 and 20 people living in each one. When contact was made with other tribes it was usually violent, so the Powhatans were trained to always be ready to kill an enemy. This is because at the peak of their power, the Powhatans controlled over 30 different tribes, and many outsiders were constantly attempting to take their land. The economy of the Iroquois was primarily based on agriculture and hunting. They also were a gathering society that picked berries and fruits. The principal crop of their economy were squash, maize, and beans. The Iroquois had a communal system of land ownership and had division of labor based on gender. Their trade system was based off on a gift-economy and was communal. Warfare was very important in their society and they believed self-respect depended on your own personal success in war like activities. The iroquois got along well with most other tribes. The iroquois tribe valued kinship and loyalty in its leaders. The Iroquois traditions were that women fell from the sky, cruelty, sorcery, cannibalism, myths, torture and supernatural aggression. They would typically have six festivals revolving around agriculture, including prayers to give thanks. Another ceremonial act they would do was treaty making. The iroquois society was matrilineal, the family lineage was traced down from the mother. The men had the job of building houses, fishing, hunting and they engaged in military activities. The women prepared the clothing and dealt with most of the food. They grew crops of corn, beans, and squash, and gathered fruits and other wild foods. The women also had a special role in determining how the food would be distributed, this was considered a strong power in the farming society. Iroquois is actually 5 tribes formed together who had a political system similar to the bicameral system. Since the bicameral system consists of two houses, the five tribes are divided up between them with the Seneca and Mohawk on one side and the other side is Oneida, Cayuga, and Onondaga. Each tribe had their own representatives, who were also known as Sachems. In this system there was an unwritten constitution, which included information about the meetings that could have started around 1590. This system was so involved and intricate at the time that it was unknown to Europe. Two of the most important parts of their political system are locality and kinship.